Prague. Prague Pride 2017 was huge , with many visitors and less protest then last years. The pride parade is the highlight of many events in the city. 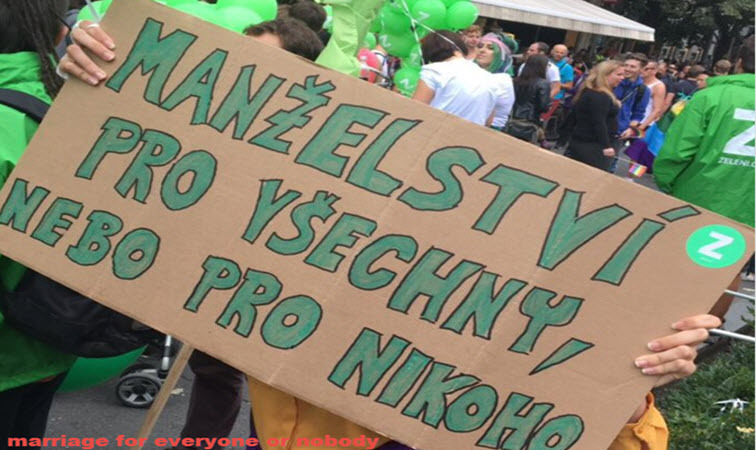 There was a small counter-demonstration of the “traditional family” model organized by Christian Democrat opponents of Prague Pride. Prague Pride 2017 brings LGBT activists from Taiwan, Armenia and Russia . 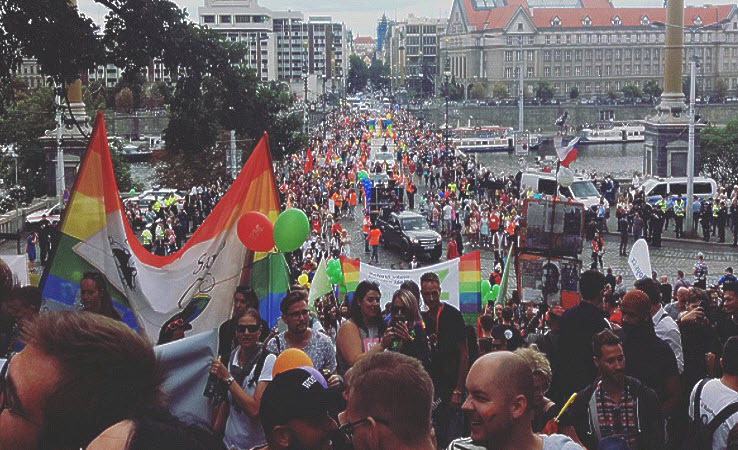 A total of 104 events are brought to you by the 7th edition of the Prague Pride, the LGBT-themed festival taking place in Prague on 7-13 August. This year’s program focuses especially on events with a human rights content, which will be attended by activists from various countries around the world. 42 organizations, companies and individual personalities are taking part in this year’s edition of the festival, which will be connected with several significant discussion-oriented and arts platforms. The campaign of the Prague Pride 2017, "Pointless Festival" puts in the spotlight common prejudices about LGBT people. The goal is to show that to be a lesbian or a gay man is just as natural as being born with a heterosexual orientation. It is not a personal choice or a fashionable trend, it is a reality that deserves to be respected. The program of this year’s edition of the festival proves that LGBT people are present in all times and spaces, including places where they risk being ostracized and even killed. The festival will focus this year on the fate of gay people from Chechnya, whose regime-directed persecution became known to the world in spring. Prague Pride is opening a public collection dedicated to the Russian LGBT Network, which helps Chechen gay people seeking refuge in Moscow. On Thursday 10 August there will be a round table discussion, Lie or Die: The situation of gay men in Chechnya with Boris Dittrich, Advocacy director, LGBT program at Human Rights Watch, activist Zakir Magomedov from Russia’s Caucasus region and with Jan Latal, head of the Transition Promotion section of the Department of Human Rights & Transition Promotion Policy of the Czech ministry of foreign affairs. Under the title Untold Stories from Armenia there will be a documentary film screening, about the everyday lives of LGBT people in Armenia. The film was withdrawn at the last moment at this year’s edition of the prestigious Armenian festival Golden Apricot. After the screening there will be a discussion with the Armenian gay activist Eduard Martirosyan. The movement for LGBT people’s rights is not a Western monopoly. From Taiwan we’ll have Jennifer Lu of the Taiwan Tonhgzi Hotline Association for LGBT Rights. Since 2016 she is also coordinator of the Coalition for marriage equality, a major actor in achieving the marriage equality for gays and lesbians, which will become reality after the May ruling on this issue by the Constitutional Court of Taiwan. Jennifer will be one of the speakers at the inspirational talk evening Pride Voices and will sit on the panel of the discussion How to win a marriage? at the Pride House. Two international personalities will put the spotlight on the situation of LGBT church believers. The Logos Czech Republic group has invited the outstanding personality of the Anglican church, the General Synod member Jayne Ozanne, who among others played a great role in the recent ban of the conversion therapy practice in that church. LGBT people are not a phenomenon of recent times, they are born in every regime. No one knows that better than the Russian historian, activist and educator Ira Roldugina. In her lecture Lessons in In/visibility: LGBT Lives Under Communism, Ira will tell us about the results of her studies in the KGB archives, where one can find files on LGBT people from as early as the 1920s and 1930s. Ira’s findings will get a follow-up from Czech activist Jana Kociánová, who remembers life in communist Czechoslovakia. Ellie Lust is bringing to Prague proofs that gays aren’t exclusively hairdressers and ballet dancers. Ellie is a Dutch police officer and chairwoman of the Pink in Blue organization – an association of the LGBT police officers founded in 1998, dedicated to law enforcement in Amsterdam. Ellie will lecture as part of the Pride Voices event and will also sit on the Police and LGBT panel. This year the Prague Pride will cooperate for the first time with the multi-genre collaborative project of the Artedu and KINOLAB platforms called SEXPOSED, which points at the socially forgotten theme of HIV prevention, but also at the problem of social exclusion and stigmatization of HIV positive people. The result of this cooperation will be four drama evenings SEXPOSED/Pride Theatre, the students’ work exhibition SEXPOSED/Uncensored dedicated to the themes of sexuality, carnality and illness and the film screening and discussion about online dating, chemsex, swingers parties and the risks of such behavior. The international film festival ANTROPOFEST, specialized in social anthropology, will present in the frame of Prague Pride two documentaries which see LGBT themes as a field for the study of contemporary anthropology. The biggest European drum & bass festival Let It Roll is sending its DJs to the Pride Village to perform on Wednesday 9 August in the afternoon and then move on to the after party hosted by the Zizkov club Storm. The Let It Roll DJ team includes Slovakia’s DJ B-Complex, who is bi-gender, a person identifying both as a man and as a woman. Prague Pride is traditionally collaborating with the queer film festival Mezipatra, which will be showing films at Hybernska 4, and with the homeless guide organization Pragulic.